When shopping for a medical alert system, deciding on a monitored or non-monitored system is one of the most important decisions you will make. Whether or not the system is monitored directly affects how you receive help should you need to use your medical alert system emergency button. Medical alert systems are a vital part of seniors maintaining greater independence, particularly with falls being the leading cause of both non-fatal and fatal injuries for seniors. When you buy a monitored medical alert system, trained staff at the medical alert company’s control center are on duty keeping an eye out for alerts from customers. An alert occurs when you press the emergency button on a pendant or wristband (known as a wearable) you wear or when other sensors paired with the system are triggered. At that point, an agent responds personally via the medical alert base unit or the wearable equipped with voice communication technology. The agent will speak to the customer to determine what level of help to send. The agent may send a close friend or relative provided by you when you sign up for the medical alert service, paramedics, or the police. A monitored medical alert system can be a lifeline even for seniors who do not live alone. If a person falls or has a medical emergency like a heart attack, the agent can get in touch with other household members via cell phone or the base unit when they are in another part of the home or out in the yard. If the system includes area-of-activity monitoring and fall detection, the call center staff can also react to an alert without pushing the wearable. Some medical alert wearable remotes do not have two-way communication capabilities. In this case, the call center may have to call emergency services if you are too far from the base station to communicate directly with them via voice. Motion sensors installed in the home with door and window sensors send information to family members via a mobile app or computer to notify of potential problems. For example, if a door is left open or the person stays in bed for an unusual amount of time, family members get a notification and can react. This type of monitoring allows family members and caregivers to offer a safety net to seniors while still allowing them some privacy and independence. Also, the medical alert call center responds if the button is pushed on the wearable. 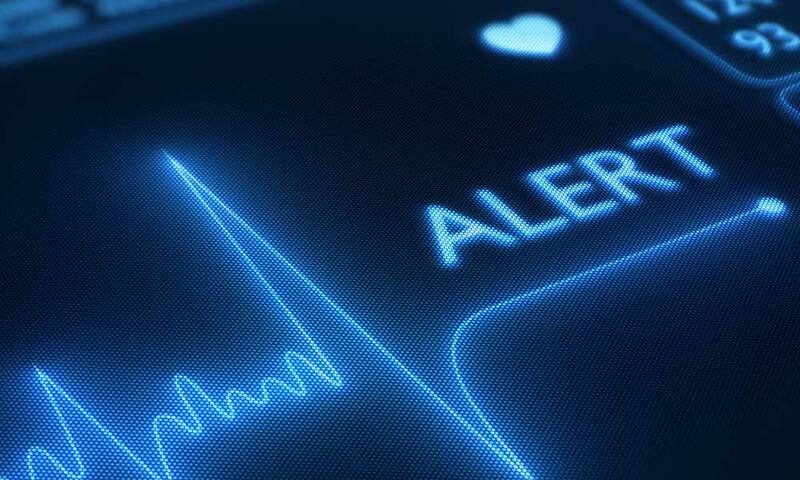 Non-monitored medical alert systems do not involve a response from a call center. When the customer presses the emergency button on the wearable, these systems either automatically dial a predetermined number, typically 911, or a small set of numbers for friends and family members. Regardless of the level of assistance the person requires, these pre-programmed responses happen every time an alert is activated. If 911 is the automatic call number, a paramedic will respond whether you need help getting off the toilet or if you have fallen and broken a hip. When non-monitored systems make a pre-programmed call or calls, they make contact in one of two ways. Some systems connect the senior with whoever answers the call first, which requires the technology to communicate in the base unit and wearable. However, it is more common for the system to play a recorded message to whoever answers the call(s). This message usually says there is a medical emergency at the system’s registered address, which is the senior’s home address. The message includes a phrase letting the person receiving the call know the alert is from an automated system. You can’t use an unmonitored medical alert system while traveling because the automated alerts are sent based on the registered home location. *User must be within the range of a base unit or use a wearable with two-way communication. When using a monitored medical alert system, the monitoring center itself can make a big difference in service level based on where it is located, the hours it has staff on duty, the response time and operators being able to speak your language fluently. A monitored medical alert system should never be the link that delays your getting help. Location: Operators at overseas call centers may not understand the nuances of your communication or recognize language and tone cues that suggest something is wrong even if the client does not say they need help. Call Center Hours: Call centers without staffing 24 hours a day, every day are not helpful since there is a chance that assistance will be unavailable when you need it most. Response Time: Operators must respond to alerts quickly to avoid escalation of a medical emergency. Response times should be measured in seconds, never minutes. Language Communication: Your calls need to be automatically routed to agents who are fluent in your native language, and you should never have to wait on hold for an agent who can understand you. Those who are fluent in your language as their second language can work well, but using a monitoring system with staff who primarily speak your language can drastically increase understanding. Call centers should also be able to provide non-emergency help by contacting friends or family members via phone numbers provided as non-emergency contacts. If you need help getting out of bed or a chair, the operator can contact someone from the non-emergency list to avoid your incurring the cost of paramedic services. Non-monitored medical alert systems usually have only an up-front cost for the base unit and any wearables. No monthly fee is associated with non-monitored systems. You may be able to lease or rent a non-monitored system. The most affordable non-monitored medical alert systems cost around $200-$300. Monitored systems include the up-front equipment cost with a continuous monitoring fee, typically charged monthly. Monitoring costs vary depending on services but usually start at around $25 to $30 a month. Many companies offer the equipment for free with a monthly subscription. Monitored systems often require an annual service center contract as well, sometimes with cancellation fees for service cancellation before the end of the contract. Regardless of whether you use a monitored or non-monitored system, having voice activation on your wearable makes it easier to get help. If you are unable to press the emergency button for any reason, you would speak a previously specified command to get automatically connected with either a call center or 911. Choosing between a monitored and non-monitored medical alert system comes down to personal preference, your living situation and your lifestyle. If you like the comfort of having a 24/7 monitoring center directing your emergency situations and you don’t mind a monthly fee, a monitored system might be a great choice. If you feel comfortable having a pre-determined contact number be the number your alert system calls, consider a non-monitored system.